Every homeschool and every classroom and every family in America should spend time on the third Monday of January learning about and talking about the Civil Rights Movement and Dr. King. Once a year is certainly not too much time to spend on a chapter of our history both so recent and so significant. The repercussions and the human characteristics that went into the era preceding the civil rights movement are still very much with us and are a big part of the public discourse today. I will risk the collective wrath of American school children by suggesting that the third Monday of January should not be a day off of school, but instead a day dedicated to learning the timeless lessons that Dr. King taught; the lessons we have yet to learn as a nation. 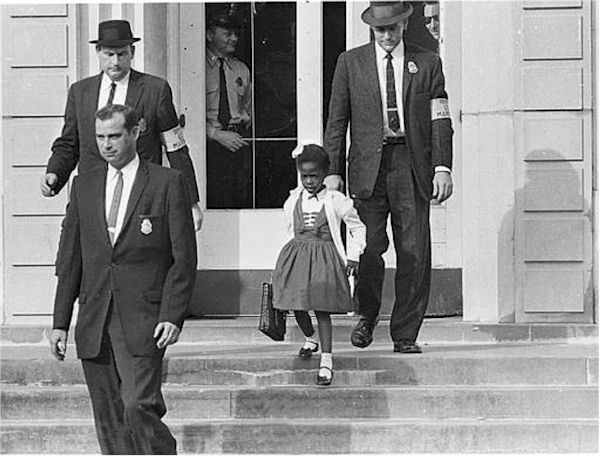 This is little Ruby Bridges in 1960 being escorted home from school by Federal Marshalls. She was, bravely, one of the first black students to attend white schools during the civil rights movement. Photo courtesy Depart of Justice, public domain. First make a Civil Rights Timeline of events running up to the 1960’s and through the civil rights movement. You can print out the PDF with text and images to place on a timeline. Get a long sheet of paper or draw a line down the center of a chalk board or white board to make a more temporary timeline. Cut out and glue or tape the events to the timeline. The images can also just be placed in order down a table or on the floor. Discuss each item on the timeline as you add it. Kids should read some books about the civil rights movement, or chapters from longer books about this era. by Larry Schweikart and Michael Allen, chapters 10 and 19. Watch the “I Have a Dream” Speech by Martin Luther King Jr. in it’s entirety. It is a powerful beautiful speech filled with amazing poignant ideas. Pre-view the whole speech first and take notes of things you think are significant and use your notes as a guide when discussing it with your kids. Talk about the historical context and the message King was giving for his day and then bring it forward and relate it to today. How are King’s ideas eternal in their truth and significance? What other groups have fought for equal protection under the law? Martin Luther King Jr. believed in and practiced peaceful protest. At the same time the Black Panthers and others were advocating violent protest. Discuss and contrast the two parallel movements and what their different outcomes were. Help your kids see the moral implications of the two approaches, peaceful or violent. Discuss how fear, a lust for power, or other negative human emotions can cause people to behave in horrible ways to one another. Talk about how you believe we can guard against such feelings in ourselves. For some reason the usual response in America to federal holidays is to take a vacation and have the day off–after all no one is against a day off. Discuss what you think the most appropriate way to spend a day like MLK day, President’s Day, or Memorial day is. Little Ruby Bridges, as shown above, was escorted to William Franz Elementary school in New Orleans by four federal US Marshals. As soon as she entered the school, every white child was pulled from her class and no teacher would stay to teach her. A white teacher from Boston was hired to teach little Ruby all by herself for the entire year. Learn more about Ruby Bridges and her courage. Talk about courage to do the right thing and what the costs can sometimes be. Beautiful post! Thank you so much for the printable my kids are about to work on this right now. Thank you again for sharing. We watched the entire thing today. Though we often hear the highlights, it was a different experience to watch the speech from start to finish. And the discussion we had with the kids was awesome. So grateful to live in this nation…even with all our faults, past and present, it is truly great. We did the timeline and watched the speech too. I love timelines. They really help you put things into their proper context and understand events from a more objective distance. Glad you all liked the post! MLK is one of my big heroes.